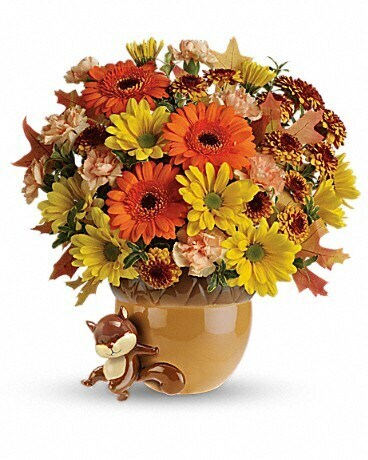 Teleflora's Send a Hug™ Fetching Fall Bouquet - by Woodhaven Florist, Inc.
An extra helping of adorable! Miniature orange gerberas, miniature peach carnations, yellow daisy chrysanthemums, bronze button chrysanthemums, oregonia and autumn oak leaves create the sweet arrangement for the Thanksgiving holiday. They come inside the cute Squirrel Away Vase, which features an entertaining squirrel as the guest star! It's simply fetching. Miniature orange gerberas, miniature peach carnations, yellow daisy chrysanthemums and bronze button chrysanthemums are accented by oregonia and autumn oak leaves. Nestled inside the unique Squirrel Away Vase and adorned by a cute little squirrel, this bouquet is sure to be a conversation piece this Thanksgiving! An acorn to adore. 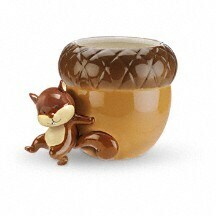 Embellished with a playful squirrel motif, this sweet hand-painted ceramic acorn keepsake will have everyone going nuts. 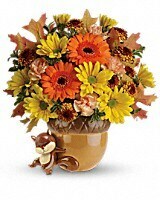 It's part of Teleflora's exclusive Flowers-in-a-Gift Collection and is sure to be a fall favorite.